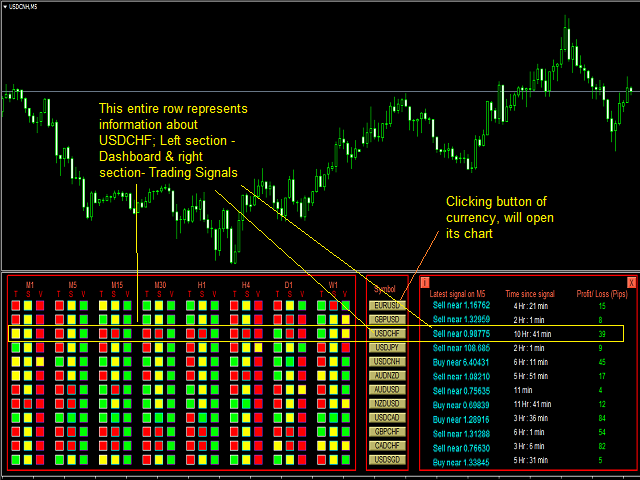 Professional Dashboard and Trading Signals is a multi-currency and multi-timeframe indicator. Dashboard displays critical components professionals use, viz. 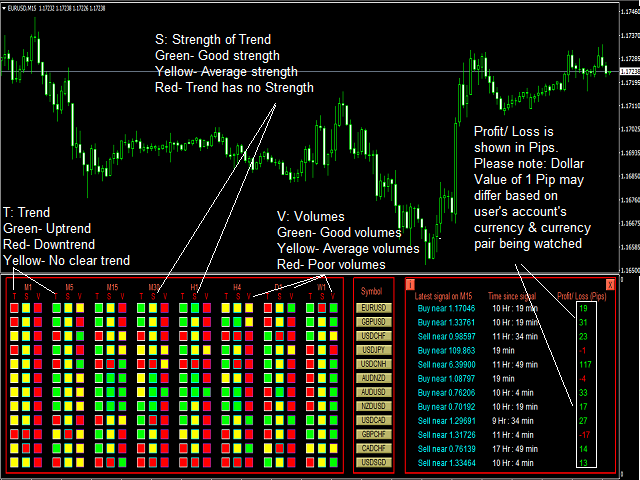 Trend, Strength of Trend and Volumes. 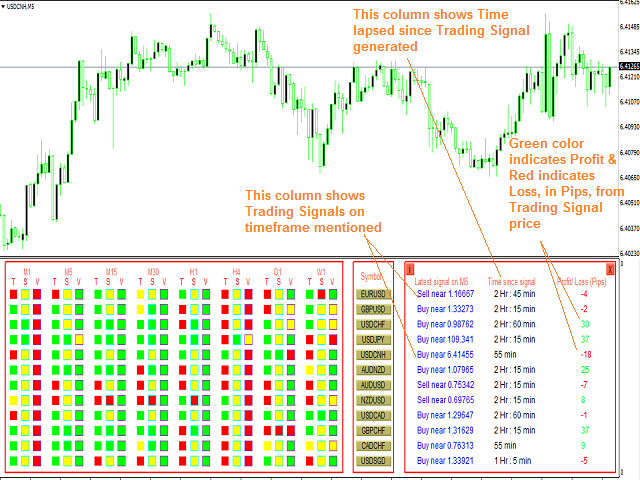 In Signals section, Buy or Sell trading signals are showed for respective timeframes. 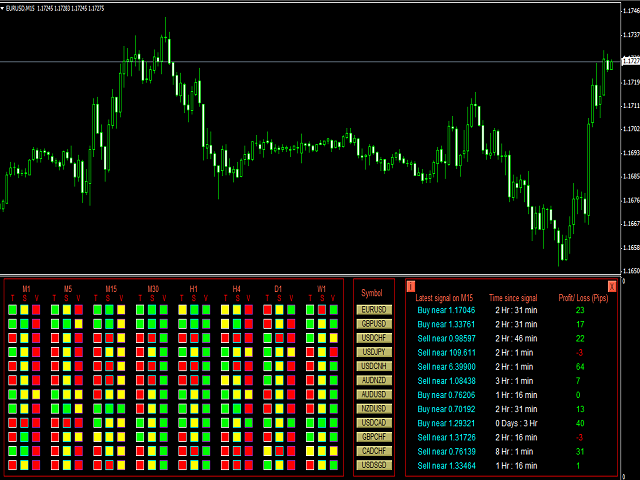 Default pairs: By default, set to True, and displays 12 preset currency pairs. Customised pairs: If Default pairs set to False, here user can mention pairs of choice (up to 12). Each pair separated by semicolon, e.g. EURUSD;GBPUSD;USDCNH. Background color: By default, set to Black. A user may choose to change it to White. 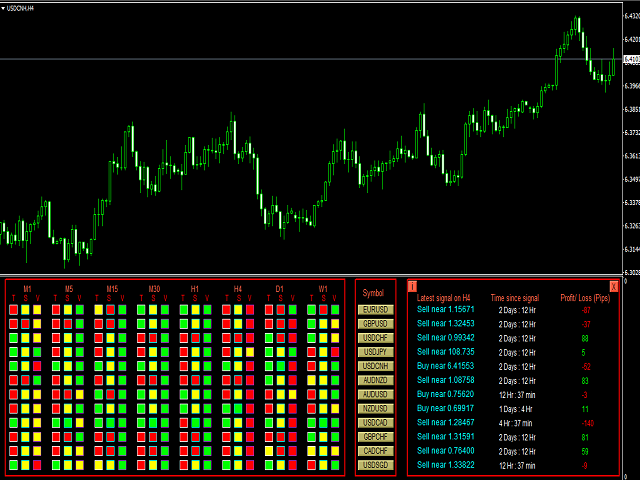 On left side, Dashboard is displayed and on right, Trading Signals are shown. Here, for different timeframes (M1, M5, M15, M30, H1, H4, D1 and W1), three fields are displayed. V: Volume - It indicates how big or small recent volumes are with regard to the past. This section shows signals for chart's current timeframe. 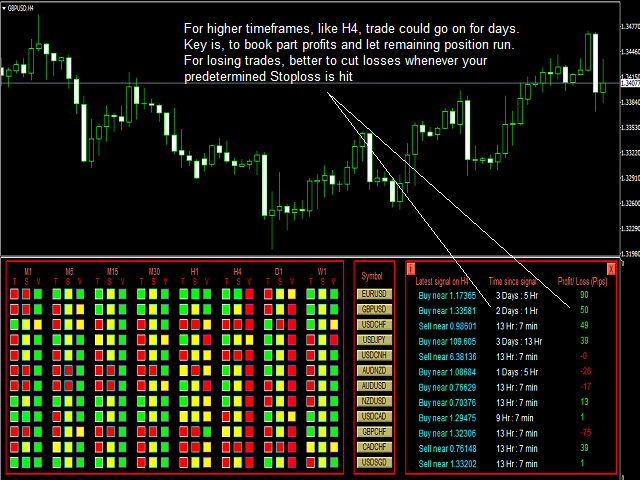 If timeframe is changed, then signals for new timeframe would be shown. 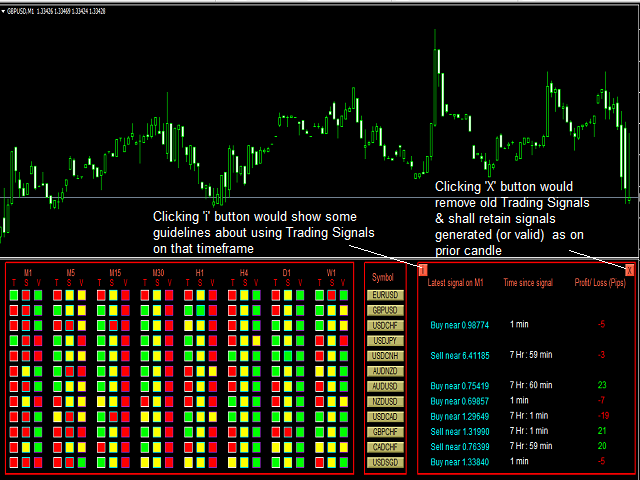 'X' button (Top Right corner): Clicking on it removes old signals and keeps signals generated on previous candle (or if old signal is still valid, it is shown with prior candle's close price). This button should be used if you see too many old signals and want to start afresh. Old signals are auto removed after few days, if no new signal was generated interim. 'i' button (Top Left corner): Clicking on it would show guidelines for that timeframe. 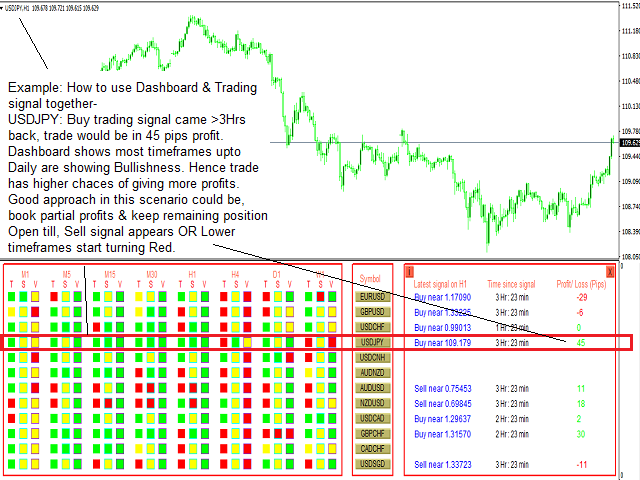 Trading signals have inbuilt logic based on price action. 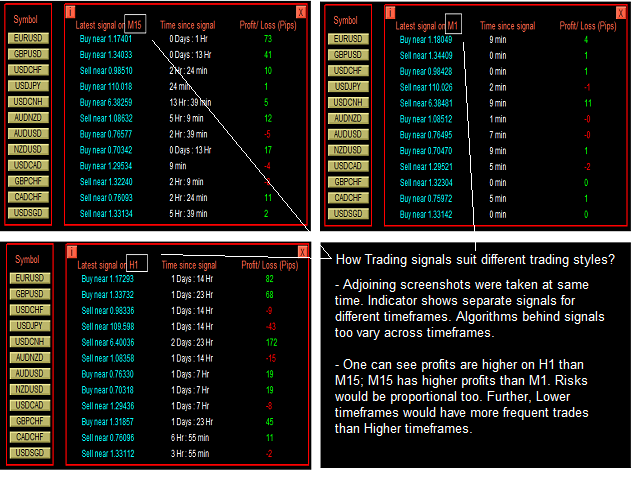 Different timeframes have separate logic for trading signals to make them more in-tune with markets, e.g trading logic on M1 makes it more suitable for scalping, while H1 is more suitable for swing trades. Risk management - like professionals, avoid risking more than 1-2% of capital on any single trade. Stoploss and Profit targets - always have stop loss in place. If market is too volatile and stop loss is wide, reduce position size or let the trade go. 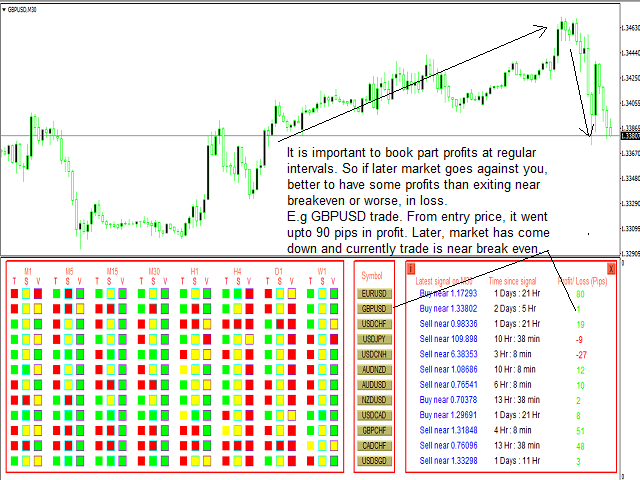 Set profit targets according to risk being taken. When trade is in good profits, book some profits and have trailing stop loss. Confluence - if Buy signal appears and for higher timeframes, Trend is Up/Strength is good/Volumes are good, such trades are more likely to be profitable. Here, even profits could be bigger (for Sell signal, look for Down trend). Trading around key economic news - conservative traders should avoid trading around important news. 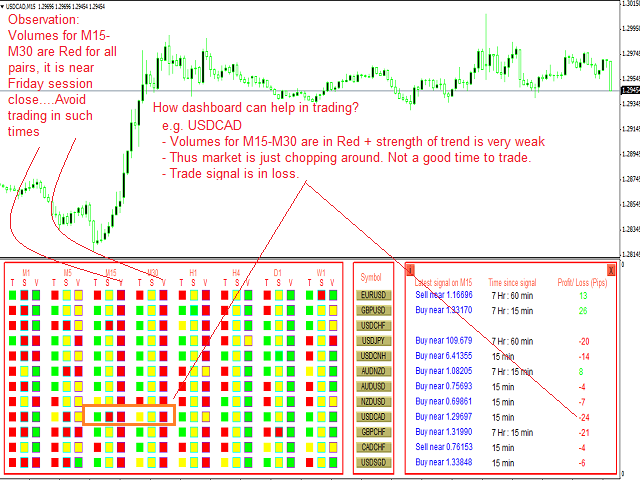 Aggressive traders can use M1/M5 chart to scalp around news' time. If you face any issues using the indicator, want to give feedback on improving indicator or need any guidance on using it effectively, feel free to contact us (Mail ID is mentioned in the About tab). We are a team of professional traders with experience in developing software. We have been in markets for 8+ years and specialize in developing trading strategies for MetaTrader 4, based on Volumes Price Action, for scalping, intraday trading and swing trading. 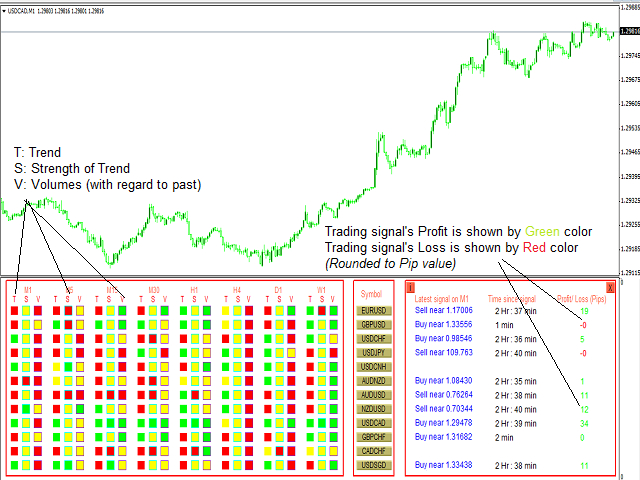 This indicator has been developed to support your trading decisions. Markets are ever dynamic and extreme caution needs to be taken while trading real money. Under any circumstances, the developer or distributor of this indicator will not be responsible for any financial loss caused, directly or indirectly, due to use of this indicator.